The wild garden can be an excellent alternative to the traditional garden. Compared to what you believe, you don’t need many hours of work to create a garden using native flora. Once you have created the basic structure, you can introduce at will the plants that you like, by sowing or planting them. At the beginning may seem a little chaotic, this is because we are accustomed to extreme cleanliness and order of traditional gardens. 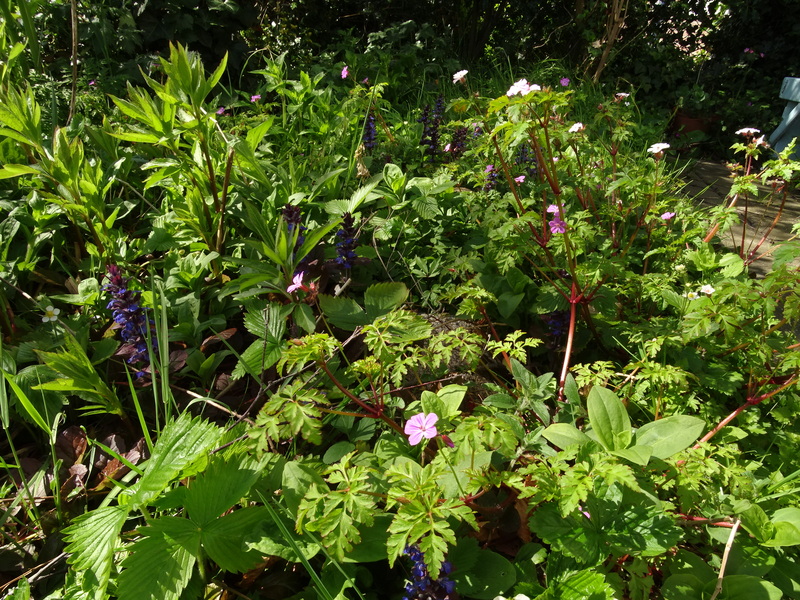 But after having used the eye to grow lush wild garden, you can begin to appreciate the species that inhabit it, not just plants, but also insects, bees, butterflies, birds and small mammals. How do I start? First of all you have to do an analysis of soil fertility, moisture, degree of sourness. After this it is important to determine the exposure, shadow, half shade, sun. This is the basis for making a choice about the type of environment that you want to create. Having some knowledge of “botanica” you can guess the type of environment more suited to observing the plants growing wild. Nature tells us with his words the environment in which we find ourselves. You might think that a wild garden you cannot build, simply because the word “wild” excludes any human manipulation. Then, leave the vacant lot and keep watching. You can also make this choice, but unfortunately over the centuries many plants have disappeared from areas where they once grew, and not come back if we do not help, especially in urban areas. For each place there are suitable plants, just consult an expert or a specialized book. After introducing the species that you think most suited, there is nothing left other than to observe how they behave. Over the years I have learned that a wild garden changes constantly, always reserve surprises. A intercropping of plants and is always a collection of individuals competing for light and nutrients in the soil. The ground levels, evolves, each phase has the combination of species acting; and the most appropriate quantity at the moment. Maintenance: Especially at the beginning, there will be the pioneer plants that tend to dominate the vegetation, you must selectively remove them otherwise they will overgrow other species. If you want to keep a sunny situation you will pruning shrubs and trees that shade the garden. Conversely, if you want a shadow zone, don’t prune. With a constant observation and study to understand the wild garden, and drive it into the desired direction through small steps. If you are used to the wild garden, you won’t see anymore a uniform mixture of weeds, but an association of plants, each of which has a name, his friends and his own needs.